From the dawning of the industrial epoch, wage earners have organized themselves into unions, fought bitter strikes, and gone so far as to challenge the very premises of the sytem by creating institutions of democratic self-management aimed at controlling production without bosses. With specific examples drawn from every corner of the globe and every period of modern history, this pathbreaking volume comprehensively traces this often underappreciated historical tradition. 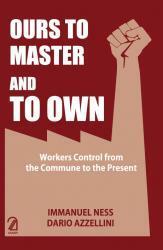 Ripe with lessons drawn from historical and contemporary struggles for workers' control, Ours to Master and to Own is essential reading for those struggling to create a new world from the ashes of the old. Immanuel Ness is a professor of political science at Brooklyn College, City University of New York. He edits Working USA: The Journal of Labour and Society and writes on workers, migration, and revolutionary politics. Dario Azzellini is a lecturer at the Johannes Kepler University in Linz, Austria, and a documentary filmmaker.